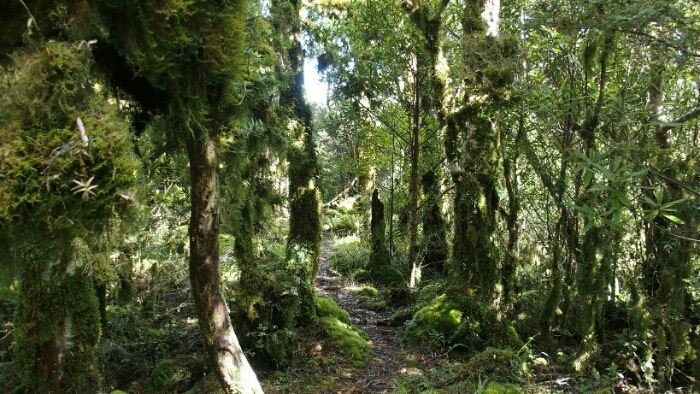 Parawei hut to Porirua. Sunshine, trail magic but also more tiredness. ​Day 64. 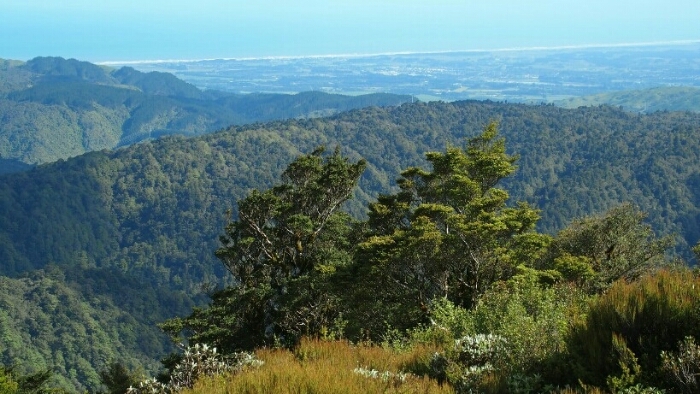 Parawei hut – Waikanae. 25km. Total 1611km. Back into my usual rhythm I start hiking at 6.45am into a blue sky and sunrise. 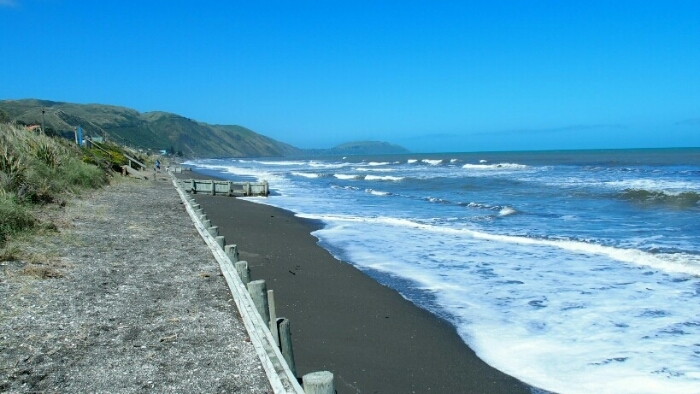 The others will follow later and I will meet Chris and Malte at our accommodation in Waikanae later. I want to take it easy today and make breaks bit still arrive early so I can finally wash my very dirty clothes and upload my blog posts etc. 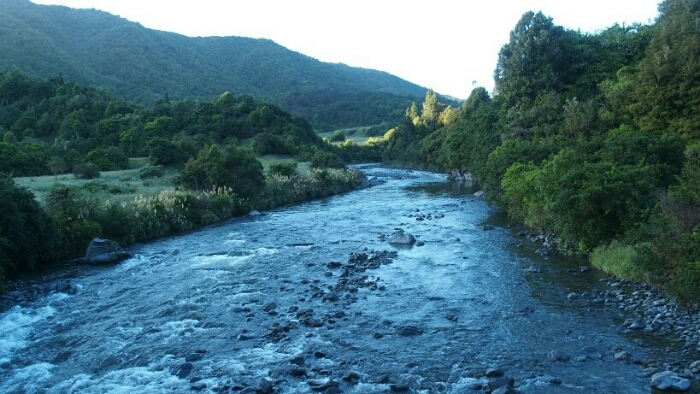 After crossing the (much lower) river on another swingbridge I follow a road for 2km to the start of the Pukeatua trail. The track is supposedly much easier than the last days – and it really is! 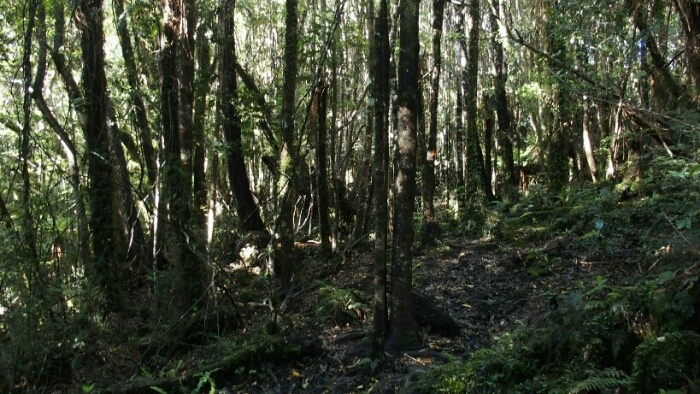 Of course some mud but nothing too bad, well maintained and although I have to climb up again to 800m to the Pukeatua summit, it’s easily doable without any major steep bits. At 9.30am I already am at the summit with nice views and phone signal (time to reply to nice blog readers who were concerned about my well being – thank you it means a lot to me!). After a snack I head down into the forest, it’s enjoyable and rather easy. 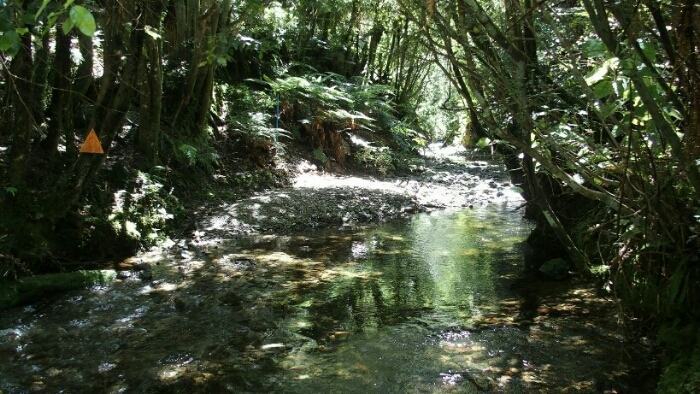 I come out to the river for and wash my shoes, gaitors and legs and have lunch. 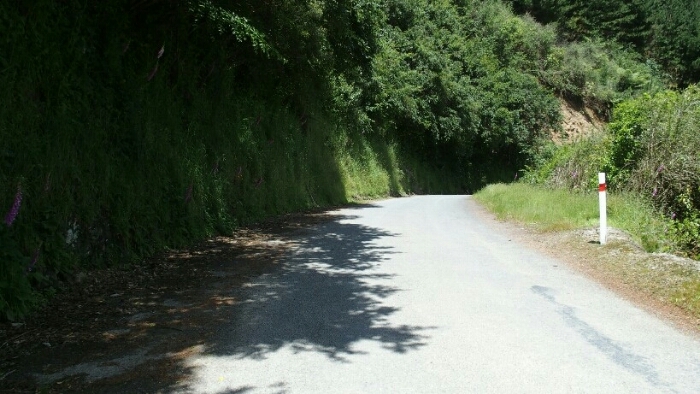 It’s 12.45pm and another 12m on the empty road to the next town, Waikanae. 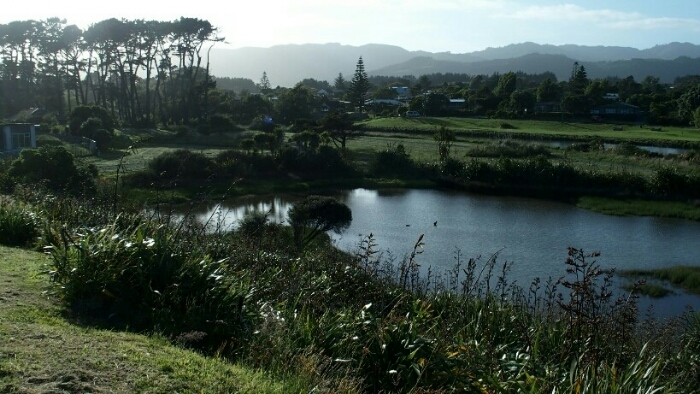 On the way I check my mails again and see that one of my blog readers, Aaron, invites me and hiker friends to stay at his house in Waikanae Beach. How nice! I ask the German guys if they want to come and confirm back to Aaron. As the guys are behind me, I have plenty of time to do my resupply at the supermarket and sit down close to a Wi-Fi signal and upload my last blog posts. It takes so much time that I am barely finished when the guys arrive. Aaron picks us up at 6pm and drives us to his house where he already installed huge tents for us to sleep. We can wash our clothes, I have a shower, we get some hot chocolate and play with the kids. A wonderful evening and another great moment of Kiwi hospitality! Thank you so much Aaron! 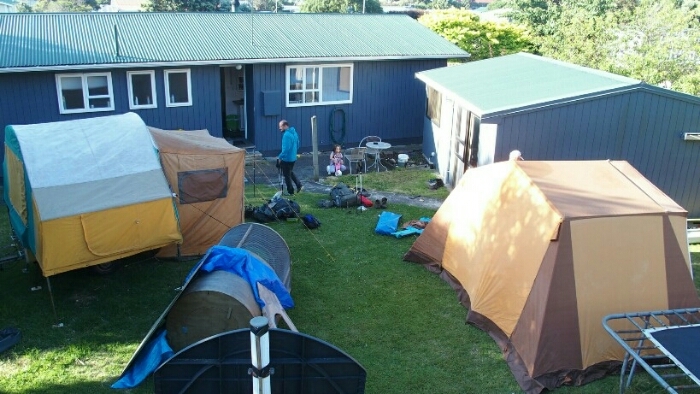 Two huge tents for us – so luxury! Day 65. 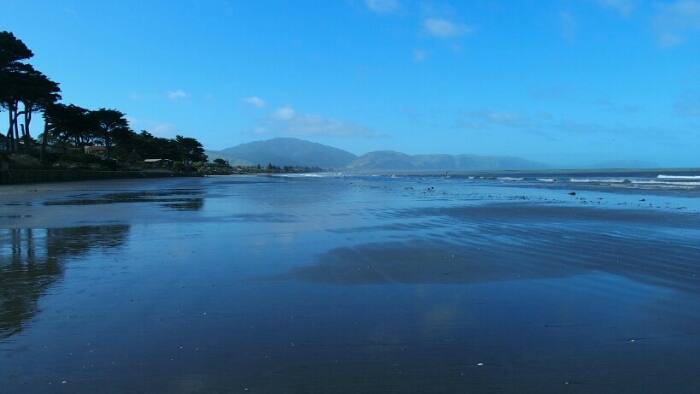 Waikanae – Porirua. 48km (only hiked about 33km). Total 1659km.As usual I wake up at 6am but wait some time before getting up. Aaron is up early and invites me for a cup of coffee with his wife. Too soon I have to leave, a long day awaits me but I am very motivated. 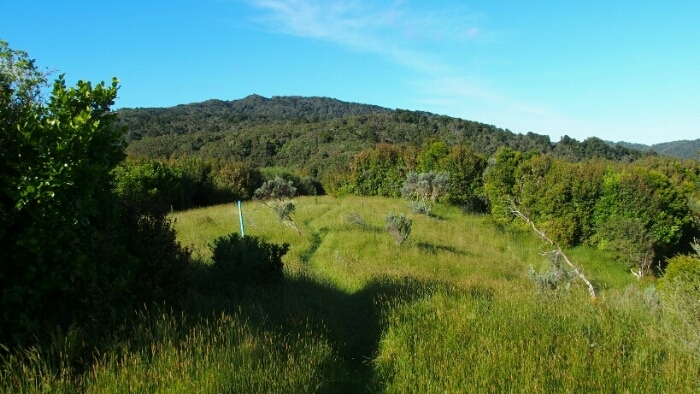 I start from the house in Waikanae Beach, reaching the trail 1km further (and skipping about 3-4km trail from town to there). 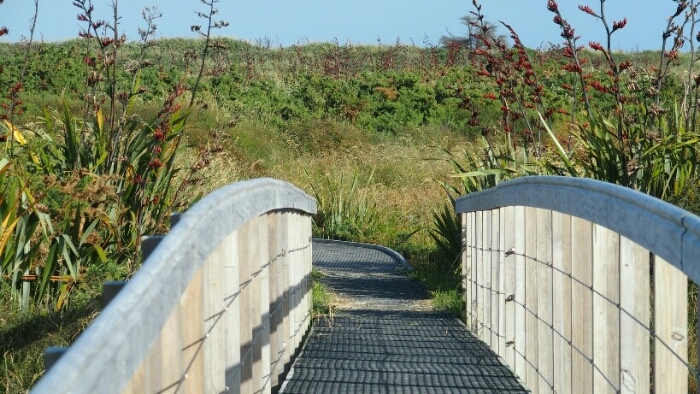 It’s a beautiful morning and the trail is very nice, along the river into the estuary and finally to the Paraparaumi Beach. 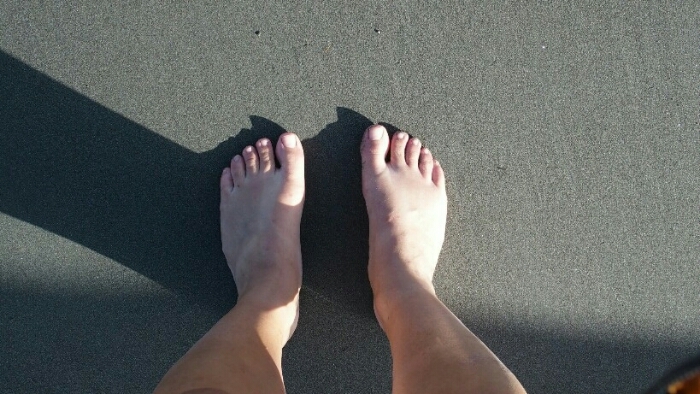 As we have low tide I can finally give my feet a treat and hike barefoot on the beach! 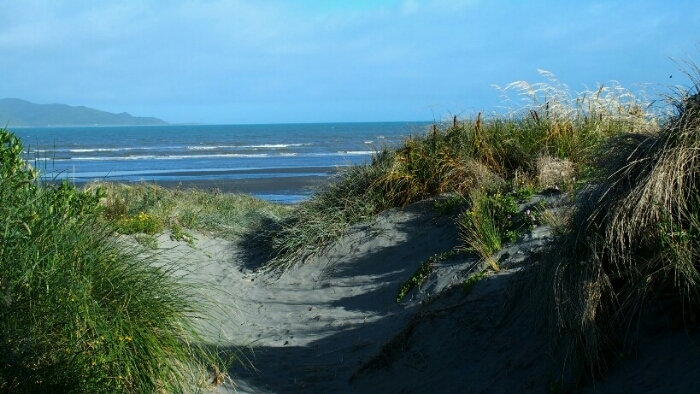 I can see Kapiti Island in the morning mist and time flies by as I almost run on the beach. 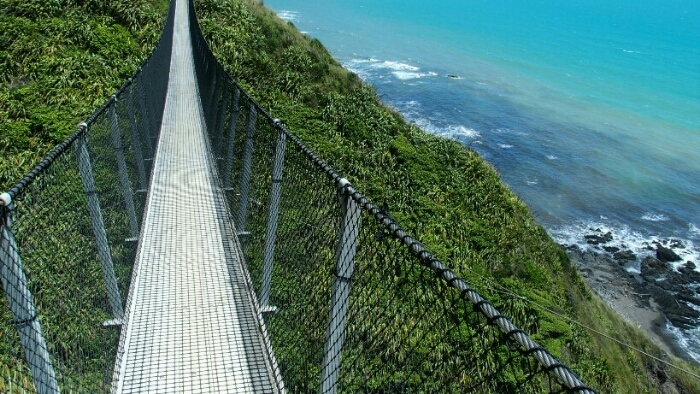 I have a break and snack at 10am just before Paekakariki on some lunch table. 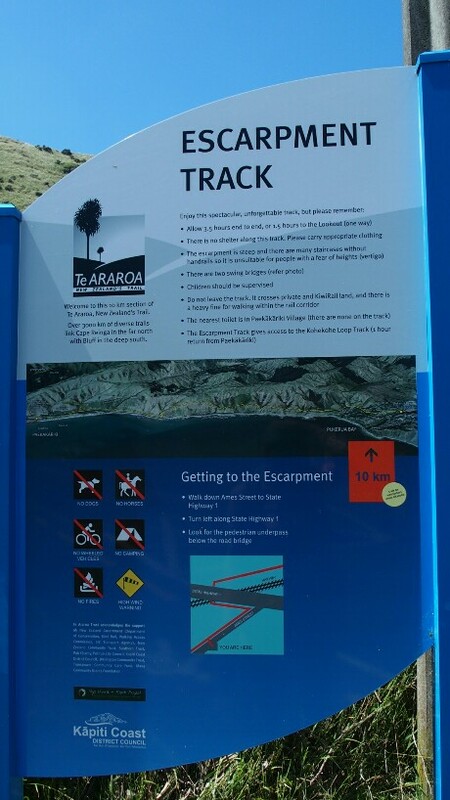 Then it’s time to put my shoes and walk to the start of the new Paekakariki Escarpment track, just opened this year! 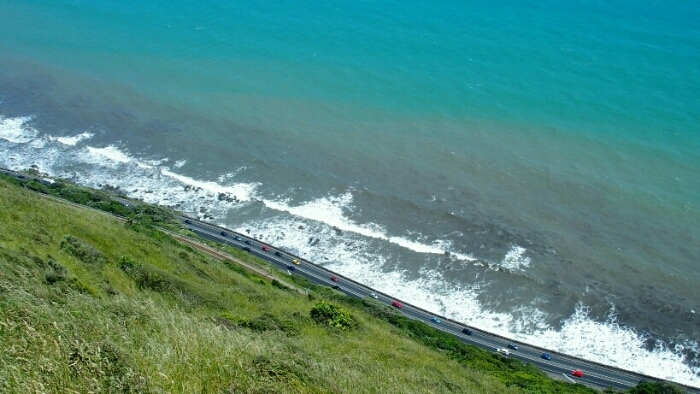 It goes up high above the coast and highway for some beautiful views. It’s very hot in the sun and there is no shelter, thanks to the wind I am still cooling down during my lunch break. Although I felt re-energized in the morning, I am exhausted again. Seems I didn’t charge up enough my batteries. Coming down into the next small town around 2.30pm at the railway station my decision is quickly made. The next train to Porirua is coming in 10minutes. There, a cheap campsite and an aquatic centre with hot pools, sauna, steam room are waiting for me. I am now skipping some 12km of the trail, but can possibly come back tomorrow. 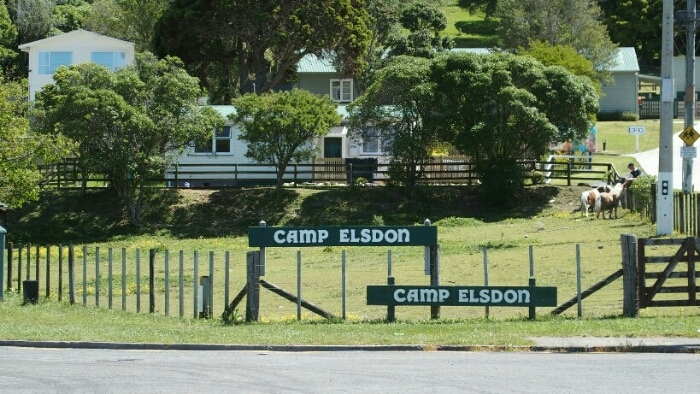 In Porirua it’s another 3km hike to Camp Elsdon. For 10$ you can set up your tent and use the facilities. And I finally get to meet the Suisse hiker Nathan! 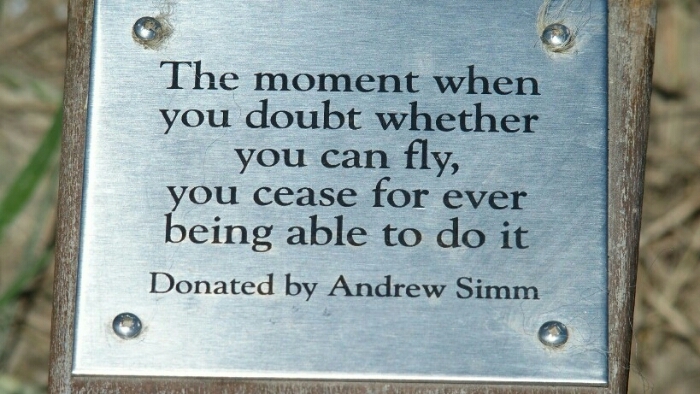 I heard about him from other hikers and saw the hut entries. He took a day off here and so I could catch up. After a quick chat and setting up my tent I walk the 2km back into town for my relaxation afternoon. They are superfriendly, entry is only 5,80$ and I get a towel for free. As I have functional underwear (no cotton) which has just been washed yesterday I can wear it instead of a bikini. The jacuzzi is a real treat, although it’s very noisy with all the kids on a Saturday afternoon. Sauna, steam room and back into the jacuzzi! (For all Germans: in New Zealand you have to wear your swim clothes in the sauna, don’t go naked! I am glad I asked about the etiquette!). Then off to the supermarket, not that I need much but I end up buying loads anyway. I ask the cashier if there is a public toilet close by (too much water drinking after the sauna). There isn’t, but I am escorted into the staff rooms and toilets! I don’t think anyone would have done that in Germany! A short WiFi session outside before heading back the painful 2km to the campsite, cooking dinner and chatting with Nathan and 2 other German travellers. Previous Post Nichols Hut to Parawei hut. 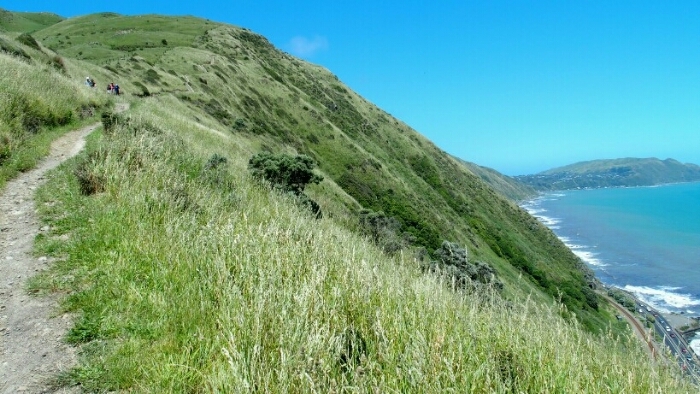 Next Post Porirua to Wellington. 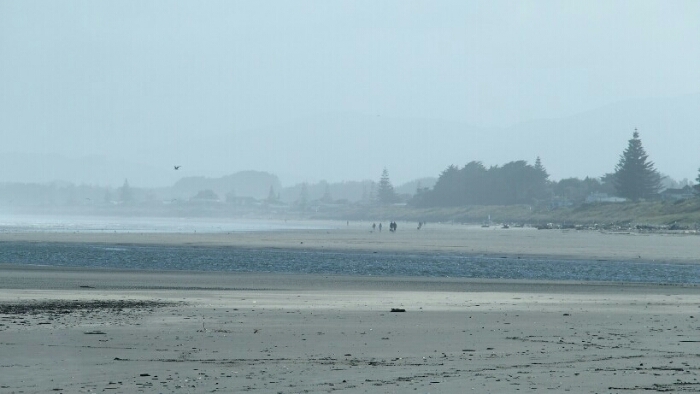 The end of the North Island story. 1702km done! You’re welcome, It’s a petty you left early, as I made bacon and eggs on toast for your friends. It was great to meet you all, you guys are an inspiration. 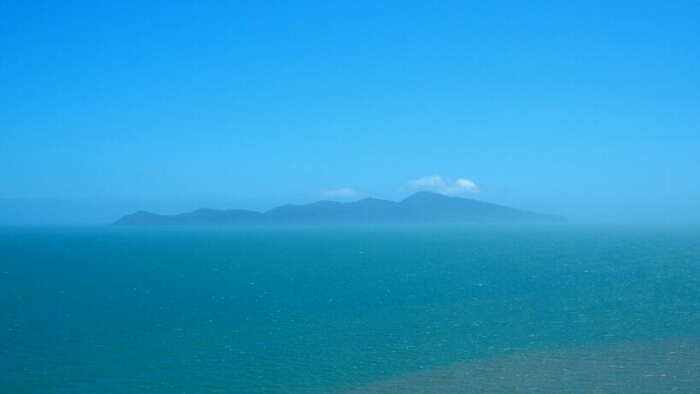 Stay safe and I hope you have a great Christmas with your friends in Wellington.